Goodreads: Blake Smiley searched the country for just the right place to call home. The professional triathlete has traveled the world, but Thunder Point has what he needs to put down the roots he’s never had. In the quiet coastal town he can focus on his training without distractions. Until he meets his new neighbors and everything changes. Ope’s Opinion: This is another wonderful Robyn Carr book from the Thunder Point Series. She just keeps writing great characters who make Thunder Point more interesting and fun to read. Lin Su’s story was a steady slow moving one. Being a mom and being hurt in the past made her reluctant to get into a relationship that might hurt her or her son. I loved the way Blake slowly, cautiously eased Lin Su into a friendship first. It was great to see all the other people in Thunder Point get updated. Robyn Carr does a really good job of naturally including the other town people in each book. She also does a great job of telling you who everyone is if this is the first book you picked up. Rating: 4 – I like this book so much I know several friends to share it with. 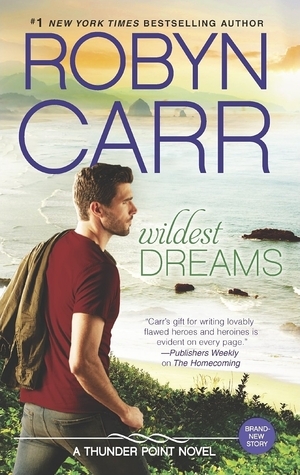 This entry was posted in Book Opinion and tagged Contemporary Romance, Robyn Carr, Wildest Dreams by opesopinions. Bookmark the permalink.